Israel is a tiny little nation with troubles imposed upon her unlike anywhere else. Love Israel, Hate Israel, not care about Israel, no matter your viewpoint, you definitely are never permitted to ignore Israel. If you follow the news you have likely noted that the Jews of Europe are feeling endangered. More so in some countries and less so in others, but in all of Europe the Jews are waking to the fact that their days of comfortable homes and safety are ending or numbered. Many of these Jews are heading, mistakenly, for Canada and the United States or even South America and places unthought of with at least half deciding to just take the plunge and return home to Israel. Yes, return home as this little nation at the eastern edge of the Mediterranean is their home from which they have largely been denied for over two millennia. Those heading for the Americas are going to be in for a rude awakening as things are starting to change and the horizons are darkening. Ms. Nancy Pelosi just saw fit to place freshman Congresswoman Ilhan Omar, (D-MN), to a coveted seat on the all-important House Foreign Affairs Committee. There are some items in the background of Representative Ilhan Omar which require inspection some of which include that she is a sworn follower of Islam, supportive of BDS against Israel, has called Israel an “apartheid regime that has hypnotized the world, and finally Allah to heap punishment on the Jewish state by which she means to annihilate Israel. 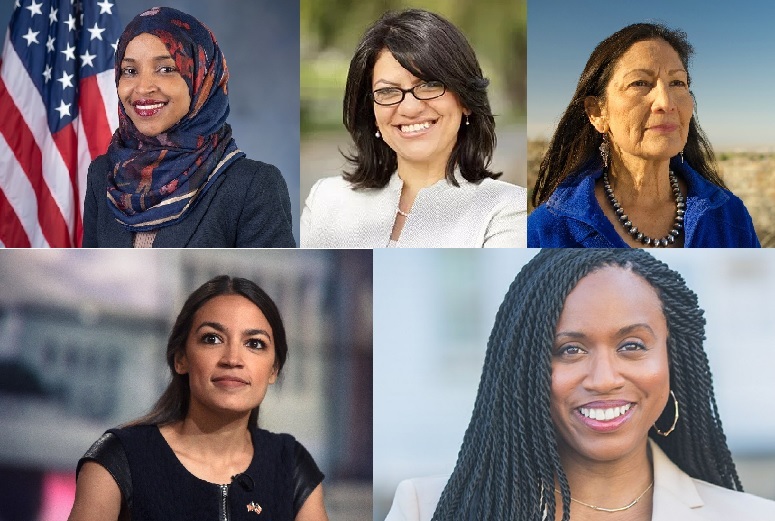 But, strangely enough, Congresswoman Ilhan Omar along with the rest of the hate Israel electees to the United States House of Representatives, which includes Alexandria Ocasio-Cortez, Rashida Tlaib, Deb Haaland and Ayanna Pressley all of whom have spoken against Israel and some have also made anti-Semitic statements and are all intending to prevent any United States cooperation with the Jewish State. Yes, my fellow Jews fleeing European anti-Semitism heading for the United States, you will find that they are less than a decade or at most two behind Europe in this matter. But, strange as this might appear, the changing Europe and dark horizons in the United States and even the fair Canada are not the biggest or most pressing problem which Israel is facing, at least not directly. Even the coming elections and a lame duck Knesset and government are but pebbles in the road compared to the deep trenches and great hill which are facing Israel in the road ahead. The deep trench right ahead and threatening all of Israel sits right above the Blue Line, a colored line with which not everyone is familiar. The Blue Line is the recognized border which was blessed by the United Nations on their inspection after Israel left Lebanon after the Second Lebanon War which was necessitated due to Hezballah raining rockets down on northern and parts of central Israel. This was when Hezballah had only received approximately thirty to forty thousand rockets from Iran and they still shut down most of Israel for some time. What was instructional was almost immediately after the United Nations inspected the position of the IDF and the placement of the fence Israel constructed giving their approval, Hezballah and the Lebanese government, but that is redundant, along with the support of close to if not over one-hundred nations of the General Assembly immediately complained that Israel was still occupying parts of Lebanon and that Israel needed to cede land to Lebanon which they were now claiming, lands which before the conflict were part of Israel. This has been the exact model on Israeli borders for the past twenty-five years, such that every time that negotiations are concluded and Israel accepts any terms, then the new set of claims as to what Israel need surrender are made. The Arabs refer to this as the destruction of Israel by pieces. Shall we get back to the threat to the north above the Blue Line. Hezballah fired or Israel destroyed most of the thousands of Hezballah missiles and rockets but Iran made good on replacing them, very good. 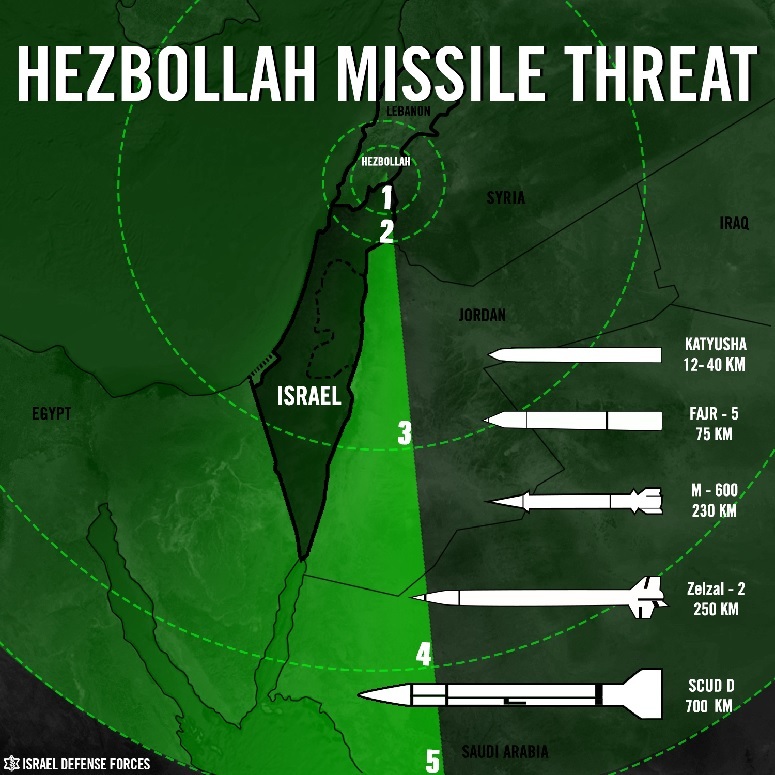 They went so far as to provide Hezballah with what is approximated at one-hundred-fifty-thousand rockets and missiles with far greater range than before and now they threaten all of Israel and their longest range rockets are capable of reaching other targets Iran might decide to have them strike such as Cairo, Alexandria in Egypt and a Saudi military airbase in northwestern Saudi Arabia. The Iranians have built up a very effective regional weapons base in southern Lebanon and the Beqaa Valley. The primary target for the Iranians is, of course, Israel, and they made sure that they gave Hezballah stocks which threaten all of Israel. But Iran was not satisfied with using just Lebanon as a base for striking at Israel. While placing IRGC forces for assisting Bashir al-Assad with his genocidal war to regain control of what is left of Syria, Iran has also placed regular forces with advanced weapons including precision missiles and other armaments for the threefold purposes of assisting in Syria, threatening Russia on their efforts to control Syria and for threatening Israel. We discussed the where and why fore of the Israeli strikes into Syria which had raised a few eyebrows recently in our article “Latest Israeli Aggression Scandal,” which explained the threats and other specifics including the coordination between Israel and Russia. What has also been of interest regarding Syria was President Trump deciding to remove the United States presence which has had the effect of pushing Russia into a closer alignment with Israel vis-à-vis the Iranian threat in the region. What is evident to any observer is that Iran is attempting to place a strong and controlling; one might even call it hegemonic, presence in Syria and Lebanon thus increasing their abilities in operating throughout the Middle East from the Indian Ocean to the Mediterranean Sea. Some have referred to this, ourselves included, as the Iranian Crescent which also includes Yemen as depicted in the map below. 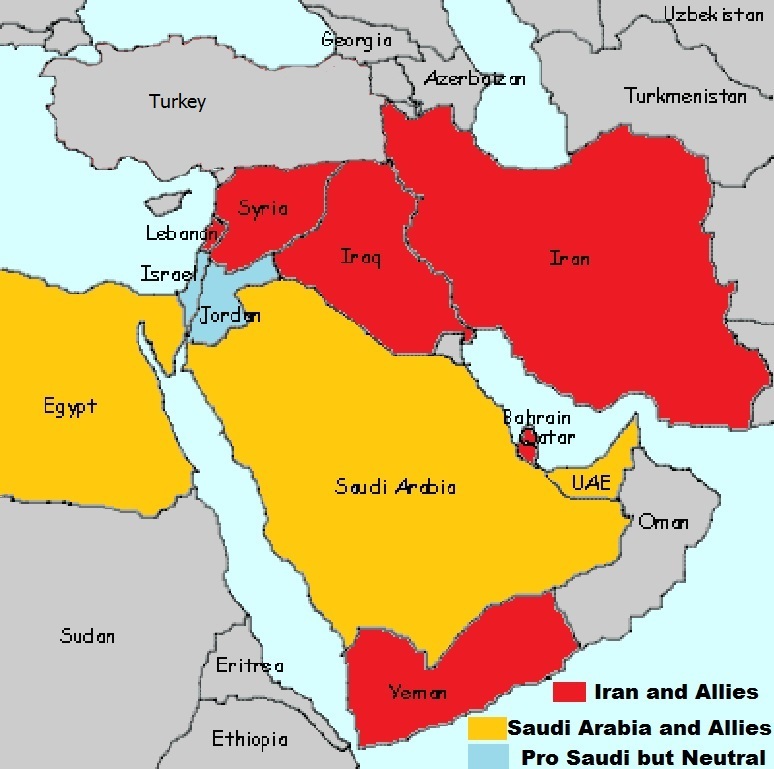 Iran has been making moves to surround both Saudi Arabia from the north and south and Israel from the north with Lebanon and Hezballah, the northeast with Syria and the IRGC as well as the south with Islamic Jihad and Hamas in Gaza. Another nation which should also fear Iranian aggressions would be Jordan as it completes the encirclement of both Saudi Arabia and Israel. Should Iran plan on taking control over Jordan, they have a willing ally already against King Abdullah II as well as being inimical towards Israel, the Palestinian Arabs who make up almost eighty percent of the Jordanian population and are allied with the PLO and other terror groups fighting to destroy Israel. This is simply another explosive situation simply waiting for somebody to light the fuse, and then Jordan will quickly look a lot like Syria and the peace treaty with Israel will have become meaningless. That is the problem with any treaty between Israel and an Arab nation, they are only valid for as long as the next leader desires it to remain so, or even the current leader if things inside the country turn sour and they need an escape, they often will blame Israel and start with the threats. One might be led to believe that Iran and Hezballah are threatening Israel with imminent demise at their hands and that such a withering attack will be coming in the foreseeable future. There may be more to that idea than one would wish to expect as Israel has placed areas of Mount Hermon off limits to civilians and placed the IDF along the Golan Heights on alert status. This is all despite Israel detecting six infiltration tunnels Hezballah had excavated under the border into northern Israel. The discovery and destruction of these tunnels, dug with technology similar to that used by Hamas to infiltrate from Gaza, likely disrupted any immediate plans by Hezballah against Israel. The one rephrase heard often when Israelis express their concerns about the threats from Iran, Hezballah and other enemies is that Israel need not worry as the United States would prevent any such attacks from destroying Israel. We feel it necessary to point out that should Hezballah and Iran mount an attack upon Israel using weapons of mass destruction, chemical weapons from Syria and Lebanon and nuclear weapons augmented by chemical weapons fired atop ballistic missiles from Iran and inside Iraq, should they overwhelm the Israeli multi-layered defenses, there would be little of Israel for the United States to save. Were Israel overwhelmed and destroyed by Iran or any other of the antagonistic threats, do not for one minute believe that the United States would start a war with the perpetrator. The most Israelis might expect from the United States is a willingness to take in any survivors providing the perpetrator did not follow up with troops on the ground taking care of any need for addressing the fate of survivors. After the disgrace during World War II and the SS St. Louis where the nine-hundred Jews were refused entry by President Franklin Delano Roosevelt as they sailed back to Germany from Cuba along the eastern seaboard resulting in most of the passengers not surviving the war, so I am not all that optimistic that any nation would be willing to take in the surviving Jews leaving them to whatever fate would follow. This is very much why Israel invests so heavily in defensive anti-missile systems and is at the forefront of every form of interceptor currently developed. Many times the United States has offered funding to advance the technologies and produce the systems is exchange for the privilege of being granted the technology for American use. Fortunately, Israel has projects which even the United States is unaware, even DARPA, which we pray we never require relying upon for our survival, but it is good to know our shekels have been used wisely. As the saying goes, if we told you any more we would have to kill you, and we would never wish for that. Perhaps, at this juncture, we should end this article.